1 is Horrible. 3 is Average. 5 is the highest rating. Well this was the much-hyped card coming out of Dark Illusion, solely based on what it was doing in the OCG. At first, I wasn’t entirely sure how to rate this card, as it caused a struggle within. On one hand, I recognize the very real immediate impact this spell has. Drawing 2 cards immediately is the ultimate desire of all players. However, in playtesting, I can attest that playing multiples of these, and sometimes even 1, can ruin your entire duel if it banishes essential pieces that can never be recovered. I’ve seen players tech Necroface to try and recover what was lost, but that’s a fool’s errand. So what’s my end verdict? Well, my real thought is that Pot of Desires is a tournament-only play, where one seeks any advantage and plays the odds to overcome a constant barrage of tier 1 decks. In casual play, it’s almost brutal to face the life-or-death consequences of this spell card’s cost. And I could see this card going through the same life cycle of Pot of Avarice, where it sees varied use from 1 to 3 until it’s restricted, but then everyone uses it because of that very reason, and then it’s banned. If I had to guess, that’s the fate I see in Pot of Desires. And even if I’m not a big fan, I have to give a higher than normal score to a card I pretty much know will one day be restricted or banned one day. This card is very polarizing and is not for everyone, but it has strong potential. It will likely get limited to 1 (or perhaps banned) since abuse of this card is well possible. It just seems like a Pot of Avarice situation where it is balanced at first, but eventually it'll get stronger. Even with the steep cost of 10 cards, you can still activate it at almost any time you want. Usually, what makes cards bad is situationality - and not necessarily downsides. Solemn Judgment and Vanity's Emptiness, for example, had steep downsides but very low situationality. Smart players will use searchers to obtain their vital cards before using this effect. The probability of getting to an important card (which you run 3 of) faster with this card is much greater than the possibility of losing all copies of the card. The banishing may even prove to be a boon for some decks, like Kozmos or decks with cards like Necroface. 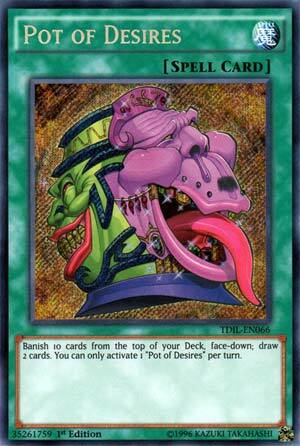 Pot of Desires is a high risk card that may not even pay off. Banishing a quarter of your deck in order to draw 2 cards on the surface doesn't seem worth it. You are most likely banishing resources useful to you, even if you run multiples of each card within your deck. The banished cards are face-down, further eliminating access to them. Necroface can bring them back to the deck, but why run another card(s) just to run this card? There are many other cards that allow you to search through and get your resources. There are even cards like Beginning of The End that cost less and give you more. Card of Demise can get you more and cost you less. Players will play this, but only one likely. Diamond Dude can eliminate the cost, but again, there are better cards. Two cards is still two cards though. Well we know this is getting banned soon. Pot of Desires can only be activated once per turn, but it draws 2 cards. That's really good. Any downsides? Oh yeah, just banish 10 cards face-down from the deck. This is a HORRIBLE late game draw because it could force a deck out situation. It is great in the beginning of the game. Imperial Iron Wall is looking better and better. Not in response, of course. Too risky for my blood, but drawing cards is always going to score well. Except Cards from the Sky, Light is always getting screwed for generic draw. Meanwhile, Allure of Darkness is at 3. Oh well. Pot of Desires is way better than that. Score: 4/5 If only it wasn't banished face-down. Art: 2/5 Lazy combo art. Oh look, closing the week, we look at another ever growing family of cards, another Pot card, in Pot of Desires. Immediately, I want to point out, this in inferior to Pot of Avarice in about every way possible. Far bigger cost for the same effect, and you remove the cards as opposed to recycling them. And you remove TEN cards from play, and you have to remove them face down (so I assume you aren't supposed to look at them). And you're only Drawing two cards, so that's a -9, at least in terms of sheer card advantage. Though, this thing could be broken as hell in Traditional. Flood the gates with God only knows what, you're likely losing at least five Monsters, and with the unwieldly speed of the Traditional Format, this could be a One Turn Kill card in my eyes, especially late in a game, even with how quickly the games go. Return From the Different Dimension and Dimension Fusion are Banned in Advanced play, and those two cards would make sweet love to this card. Yea, I mean you could use it in a few unconventional Decks in the Advanced Format. This card is obviously better early on, like first or second turn. Too late in the Duel, it could cripple you, or even not be useable at all, as you don't want to Deck yourself out though. Traditional: Honestly, I give this a 4/5 in Traditional. It won't always be able to be used as said, but if you get it early enough, I see (again as said) One Turn Kill potential.